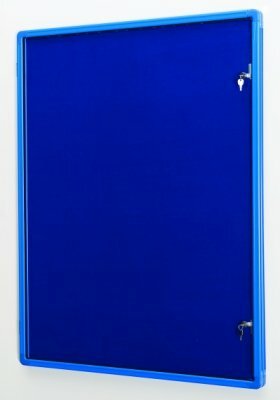 These colour co-ordinated powder coated aluminium framed noticeboards with fire rated felt finish are available in 3 attractive colours. The frame is fitted with rounded safety corners and comes complete with wall fixings as standard. Single door models can be fitted either portrait or landscape with the door opening on the long edge. Double door models can only be fitted landscape. Fire rated felt finish is available in three colours. Colour co-ordinated aluminium frame with attractive rounded safety corners. Frame will match selected board colour. Single door models can be fitted portrait or landscape, double doors landscape only.